BAM, Iran (Reuters) - Power supplies are erratic, telephones still unreliable and most services disrupted but the flow of opium into the earthquake-hit city of Bam has carried on unabated, several residents said Saturday. A city in the corridor of illegal drug trafficking between Afghanistan and Europe, Bam is home for many of an estimated two million drug addicts in Iran, according to government officials. Despite the quake devastation, several people said there was no trouble finding cheap supplies. "People ask us whether we would like to be sent to another city, but I tell them, 'I would rather stay here and smoke,"' a man named Hossein told Reuters, deeply inhaling from a cigarette inside a makeshift Bam relief tent. Hossein, running his fingers through his black beard while sitting cross-legged, said the ancient Silk Road city was still awash with opium even though almost every other service was severed by the December 26 quake that killed at least 30,000. If anything, Hossein and others said, the chaos and flood of foreign aid and rescue workers to Bam after one of the worst disasters in decades had ironically improved the supply from traffickers who often use camels to carry their booty. He explained police guarding Iran's frontiers to Afghanistan and Pakistan had been redeployed to Bam to prevent looting -- meaning drug supply routes from the southeastern province of Sistan-Baluchestan were no longer so closely patrolled. "Supply is very easy," said Hossein, tapping out the ash from his cigarette. "I would say someone in every third tent here is an opium smoker." Opium and heroin from Afghanistan, the world's biggest producer, as well as Pakistan flood across Iran's porous eastern borders. Much of the world's opium seizures are made in Iran, where drugs cost only a fraction of their price in the West. Officials acknowledge they only intercept a small proportion of the thousands of tonnes of drugs that pass through Iran each year. The transit has created a domestic market. Officials say about two million in a nation of 66 million are addicted. 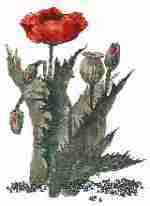 Hossein's wife said the poppy seed was a key element in the local culture. "If someone comes to your home and you do not offer them a dish of opium on charcoal then they assume you are uncivilised," she said, prompting Hossein to quickly offer to fire up a fresh batch. Several others confirmed Hossein's views, even though addicts are generally reluctant to admit their habit. White-bearded Mohammad Emamifar, in a tent in another part of Bam, said he did not use opium but said the problem was widespread and the earthquake had not changed that at all. "The drug culture is very bad," he said. "But really the government must set up clinics to help these people."